Here is a design that I thought up awhile back and recently got an excuse to try. Chalkboard Nails is running a nail art contest for either warm or cool colors, and of course I picked cool. My design? 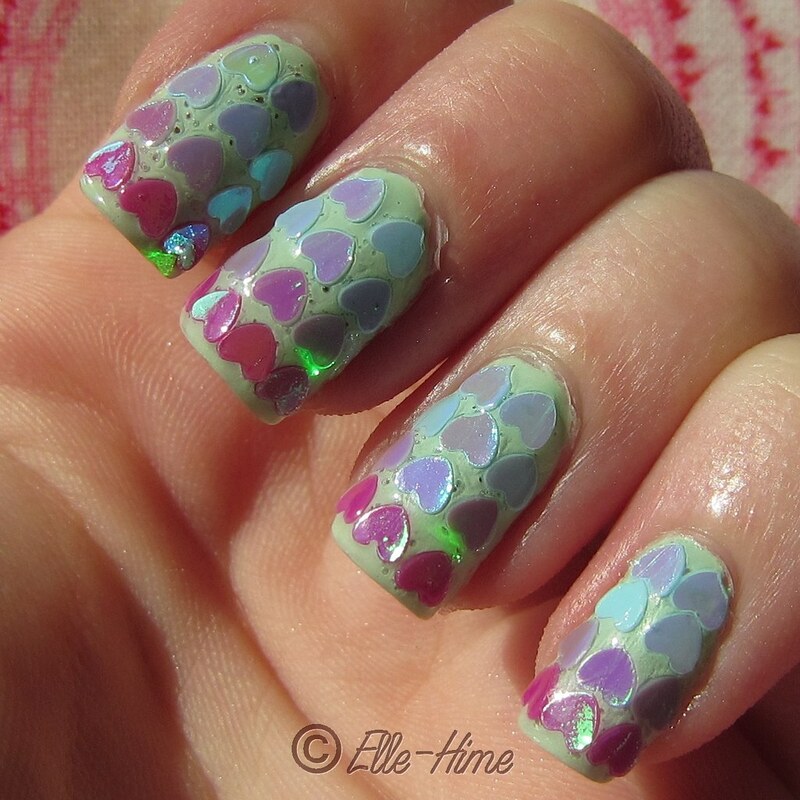 Use heart-shape paillettes upside-down and tightly packed so that they look like fish scales! 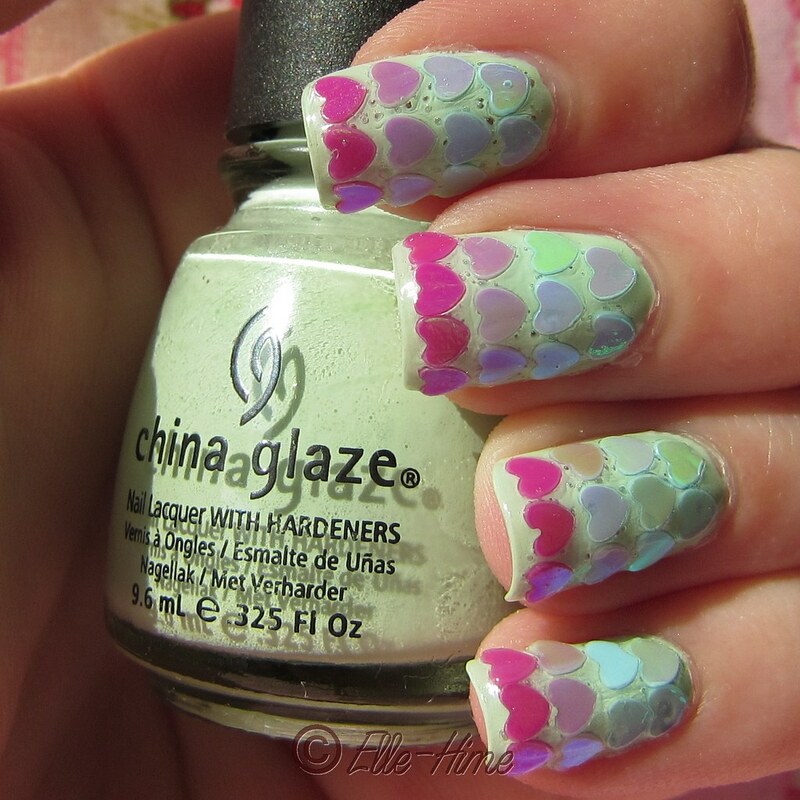 I used China Glaze Refresh-mint as my base and pressed rows of scales into the polish, starting with fuchsia at the tips, then a row of lavender, and finishing the nail in baby blue. My thumb nail had the colors staggered farther up the nail one one side. This took two coats of Tough Coat and a coat of Poshe to seal everything and there was still texture, but it was an interesting, smooth texture, and it wore like iron. I didn't shed a single scale! Sadly having that many paillettes means quite a few bubbles. They seem to form no matter how much time I take or how carefully I place the little spangles. =( Fortunately from a regular viewing distance they are hardly noticeable. All the scales have a bright green-to-purple flash that shines and dazzles you in the light, haha. No really, see the bright green flashes? Aptly noticed by a middle-aged man at work: "Whoa, that's quite the paint job! I like your nails." Would you try this? Leave me a comment! tore to bits until it absolutely was collected by way of a friend and raleigh nc my family flew delta.